Rain, sun and wind wear down Hillsborough County roofing relentlessly year after year causing both minor problems and major damage. With proper maintenance and yearly routine service from a professional Tampa roof repair specialist your home can be kept in excellent shape for decades. Aptera is here ensure that homeowners who need a professional roofing contractor in Tampa can select from honest, reliable and experienced pros who can fix all types of roof leaks, broken shingles and more. The cost of roof repair in Tampa can vary depending on how severe the damage is, the type of roof and whether it is an emergency or not. Sometimes a roof may only need a simple patch while other roof problems may be so severe that the entire structure needs to be replaced. How old is your roof? If it is over 25 years old and needs repairs every year, it may be time to consider a full roof replacement. The typical homeowner will spend anywhere from $300 up to $1,000 dollars on roof repairs in Tampa each year. Low cost repairs include clogged gutters, cracked flashing, cracked vent booting. Repairs that tend to cost much more due to labor and the price of materials include broken or missing shingles, and sometimes skylight leaks depending on whether or not the actual skylight needs to be replaced, or if the area around it just needs to be resealed. A leaky roof can also be caused by vertical connections in the roof where it meets other materials such as wall masonry or ridge vents. 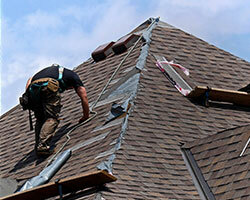 There are ways that you can minimize the cost of roofing repairs in Tampa if you just take the time. An absolute must is comparing multiple prices from roofing contractors in Tampa, Plant City and Wimauma to make sure that you are not paying at the very high end of the spectrum. *Note that we do not (always) recommend going with the cheapest roofer in Tampa because quality of work is so critical and you don't want to have to deal with and pay for the same problem again in five years. The best advice that too few property owners utilize is scheduling yearly maintenance to fix damage before warning signs are even present down below. By the time your roof is leaking noticeably the damage has likely been accumulating for at least a few months. It's never easy, but when constant repairs need to be made on an old worn down roof the best decision is often to completely replace it. While it is expensive and a hassle, getting a completely new roof in Hillsborough County can sometimes save you money in the long run if you have to repair your roof several times due to reoccurring damage. A silver lining is that when you go to sell your property, the enhanced aesthetics and durability of a new roof can increase its value. The average cost of a brand new roof can run anywhere from $4,500 for an asphalt shingle roof in Tampa, to $25,500 and up for a metal roof in Tampa. High end example: a slate roof can cost the average homeowner as much as $155k to replace. While there are many different types of roofing materials out there that can add more style and aesthetic value to your home, the affordable asphalt shingle roof is one of the most common types in Hillsborough County. Most homeowners tend to pay around $12,500 on average for a complete replacement with asphalt shingle. Pro tip: In addition to general certifications, always try to work with a contractor who specializes in your type of roof to reduce the risk of employee error. The NCRA's (National Roofing Contractors Association) has multiple programs for different roof types. The pitch of a roof can also have an impact on the total cost of replacement or repairs. Some roofs have a high pitch while others may have either a low pitch or none at all. The more steep a roof is, the more difficult and dangerous is it to fix, thus increasing your cost. With steeper pitch it also takes more time for Tampa roofers to complete the job (especially if they have to use additional safety equipment, harnesses, nets to prevent tools from falling, etc), and many times the roofing contractor will have to pay for insurance costs. Decisions, decisions, decisions. Aptera roofers in Hillsborough County will help educate you to make sure you are able to strike the perfect balance between a long-lasting durable roof and an aesthetic charm. First, there are four basic material types which include asphalt, tile, slate and metal in order from least expense to most expensive. Asphalt roofs will require several types of repairs over their lifetime but leaks are the most common and range from simple to severe. Damage caused by heavy storms, wind, hail and ice are the primary culprits but sometimes pests or falling trees can strike as well. Improperly sealed (or simply worn) vent pipes can also wear out and require repair over time. Many people enjoy a skylight on their roof but they can be the cause of another common repair job in Hillsborough County. Many times the skylight itself may be broken, or the seal around the glass breaks. Chimney flashings (the sheet metal material that maintains a watertight seal between the roof and your chimney) can pull away from the roof or wear out if exposed to weather, and often they are not installed properly in the first place. All of which can cause severe leaks. Finally, the roof valleys on asphalt shingle roofs cause problems as they often collect leaves and debris over time. By having roofing companies in Tampa regularly clear and inspect these problematic areas, you can help to encourage the natural down-flow of water which will help keep your asphalt roof in better shape. Slate roofing is strong and durable and is the choice for homeowners with a little extra money to spend so they don't have to worry repairs as much as they would with asphalt shingles. However, slate roofs do require routine maintenance and should be inspected annually for common issues like cracks, broken or loose slates. Tip: work with a roofing contractor in Tampa that specializes in slate roofing because there are techniques that they can hone that are unique to repairing and replacing slate that non specialists won't have. Tile roofs are a beautiful, affordable option for the homeowner who wants a roof that will last longer than shingles but cost less than metal. While most will last for 50 years or more, they are prone to several common issues including cracked and sliding tiles. Left unchecked, this will expose the roof underlayment to harmful sun rays, rain and more which can cause even further damage. A damaged underlayment can also cause leaks which lead to interior damage as well. Yearly inspections also look out for corrosion, soffit and roof edge damage, and valley failure. Many people looking for a premium long lasting option are choosing metal roofing in Tampa. This may come as a surprise to some, but modern metal roofs are come in a huge variety of styles, textures and colors and often even come with a 50 year manufacturers warranty. Try finding that on any other major purchase for your home. If you can handle the marginally higher upfront cost of a metal roof in Tampa, you will enjoy future savings that include reduced insurance rates, energy costs (up to a third less than a traditional shingle roof), and home resale value. Won't my metal roof rust? It is critical to work with a metal roofing contractor in Tampa that focuses (preferably solely) on metal roofs. In addition to simply being able to offer a wider variety of options from more manufacturers at a lower cost, they will be better equipped to educate you on the type of metal roof that will work best for you. You want your roofer to be able to explain the benefits of a standing seam metal roof or the difference between galvanized zinc or galvalume, (a mixture of zinc and aluminum) in layman's terms. Building owners who want a commercial metal roof in Tampa enjoy the same benefits, but can also help with LEED certification. Though rare, metal roof repairs include missing or corroded fasteners, splits, holes and protrusions in the metal surface. Rust inhibitors and primers usually keep rust at bay. One common trait of all good roofing companies in Tampa, Plant City, Wimauma, Valrico and Thonotosassa is that they are patient to answer all of your questions regardless of how minor. This list will get you started but make sure to write down any additional questions before the initial consultation. Do you have workman’s comp insurance? Insurance is not cheap and many Hillsborough County roofing contractors would rather take their chances than pay the price up front for protection. Of course, if a company is not covered, and an accident occurs on your property, you could end up paying out serious legal fees. Can you remove my old roof? A good contractor will remove the existing roof, though some will suggest saving time and money by placing new shingles over an old roof. This not a practice we recommend as soft spots or rotting wood lying underneath your old shingles can remain a problem. Am I charged more if there is bad weather during the job? Bad weather can happen at any time and it is important that your Tampa roofer has a backup plan for heavy rain and storms that occur in the middle of your repair project. Most will bring along large tarps or plastic covers that will cover over any open spaces to protect your roof and home until the storm passes. This will help to ensure that everything remains dry until the company is able to return back to work. Aside from the inconvenience of a delay, you should not be charged extra. Do you recycle material from my old roof? Will my landscaping be protected during the course of the job? Ask for details on job site precautions to ensure that the landscaping does not become damaged. No one wants to come home to a brand new roof and torn up lawn due to heavy equipment and traffic patterns. Can I receive a written estimate? Before you sign paperwork be sure you have a detailed estimate that includes the cost of removing the old roofing materials, roofing materials, labor and anything else that may come up during the job. Here are a few final tips on how to get the best roofer in Tampa, Plant City, Wimauma and Valrico for the particular repair job that you need. Interview several contractors: Get the numbers for two or three Aptera recommended roofing companies and call them up for an interview. Ask the questions listed above or bring up any other concerns that you may have about the job. Once you have narrowed down your choices based on the answers you received, you can base your decision on which company offers the best price estimate. Read up on customer reviews: Though not very useful to gauge the skill of a roofing contractor, reviews can weed out those with terrible customer service. Get Referrals: Get feedback from a few customers that have had similar roofing work done on their homes. Trust your gut: If you notice hesitation when asking about price estimates, insurance or licenses, it may be best to move on to the next candidate on your list. All Area Roofing & Waterproofing, Inc.
Tampa roof repair costs $1,058, roof installation costs $7,773. Plant City roof repair costs $899, roof installation costs $6,607. Wimauma roof repair costs $999, roof installation costs $7,337. Valrico roof repair costs $1,069, roof installation costs $7,852. Thonotosassa roof repair costs $901, roof installation costs $6,615. Sun City Center roof repair costs $916, roof installation costs $6,729. Seffner roof repair costs $829, roof installation costs $6,090. Ruskin roof repair costs $828, roof installation costs $6,085. Riverview roof repair costs $872, roof installation costs $6,402. Odessa roof repair costs $934, roof installation costs $6,858. Wayne Gonzalez Roofing Contractor, Inc. Estimated prices include all labor, materials and disposal of old roofing. Replacement prices include installing to manufacturers required standards for warranty validation by a licensed & insured roofer. Repairs on roofs with solar panels, metal roofs or those that require additional structural reinforcement will add to the cost.